Send a message to @DKBooks.AU on Facebook telling us which activity from The Great Outdoors Activity Book is your favourite and why for your chance to win a $500 voucher courtesy of Anaconda! Gear up and get the whole family outdoors to experience the wonders of nature and tons of fun – no screens required. Promotion commences 9AM AEST 17/09/2018 and concludes 11.59PM AEST 31/10/2018. Promotion is open to AU residents only. Only one entry per person will be judged. 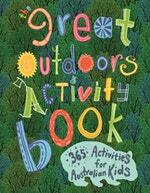 To enter, select an activity from The Great Outdoors Activity Book and send a message to @DKBooks.AU on Facebook telling us why this is your favourite activity. The winner will be selected on 1 November 2018 before 5PM AEST and be notified by Facebook message. If there is no response within 48 hours, a new winner will be selected. The prize is an Anaconda eGift Card of $500 value. The winner will be required to provide their contact details, which will be shared with Anaconda, who will supply the prize directly. Get outdoors and explore nature with a new activity every day of the year.